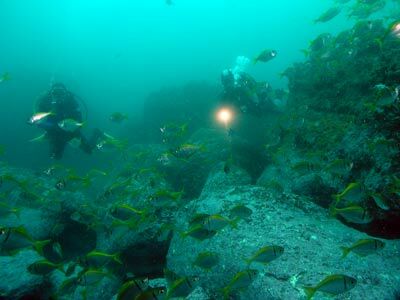 "Shiprock is a fantastic dive with prolific fishlife at most times"
The Central Coast of New South Wales is one of the most popular holiday locations in the State. Only just over an hour from the centre of Sydney (even less from the northern side), it stretches from the northern shore of Broken Bay to Lake Macquarie. The diving along this whole section of the coast is excellent, although to be honest I do not have a great deal of experience here. One of the better places to visit is Norah Head which is towards the northern end of the Central Coast (90 minutes from Sydney). There are some very good dive sites here as well as some nice caravan parks to stay in. The only real problem with diving Norah Head is that the boats have to be launched from a very rough boat ramp straight across the beach into the open ocean. This limits the types of boats that can be used (for example there is no way I could launch my own boat here) and also limits the weather conditions in which boats can be launched and retrieved. Just a little over a kilometre or so from the boat ramp is a bombora called The Bull or Bull Rocks. The reef here comes up from about 20 metres to the surface. You do not really need a GPS, just head to the north-east of the visible rocks and anchor when the reef drops to 22 metres. The site consists of a wall running from north-west to south-east. 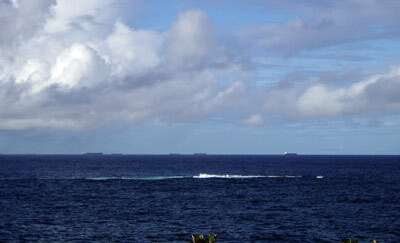 The reef is about 12 metres on the top and about 22 metres on the bottom. Off the wall it is a sandy bottom and there are some boulders. These spread out a far distance off the main wall. If you are anchored here, you can have trouble finding your way back to the anchor at the end of the dive. Along the wall there are hundreds of boulders, some the size of a table, some the size of a room. From where you have anchored, swim till you hit the main part of the wall and then follow it to the north-west. 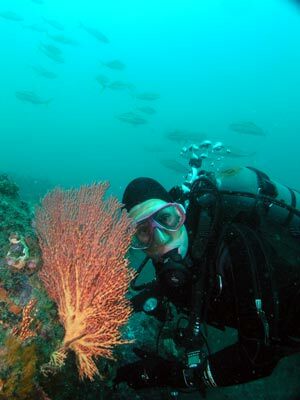 As you go, swim around the boulders, looking at the great gorgonias, sea squirts, sponges and other fixed life. On my dive here the fishlife was simply amazing. 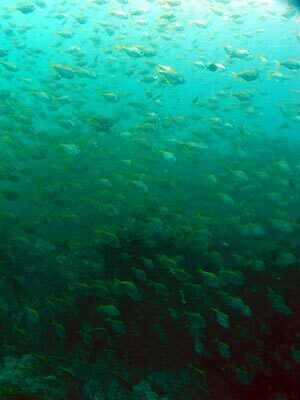 We saw a few schools of kingfish, some huge schools of seapike, trevally and yellowtail. After you have followed the wall for 10 minutes or so, head back in the opposite direction. Back past the anchor area you will find that the boulders are more pronounced. If you go a bit shallower you will probably encounter enormous schools of ladder-finned pomfrets. There were so many in spots you could hardly see the reef. Once you have gone south-east for 20 minutes, head back to the north-west for 10 minutes and you should be back near where you started. Spend your remaining time here. Other fish you may also see are large schools of luderick coming from the reef top to the bottom and eastern blue devilfish and giant cuttlefish. 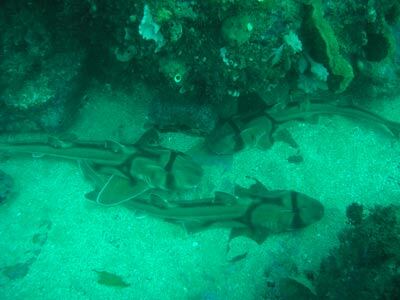 In Winter and early Spring there are also lots of Port Jackson sharks in between the boulders. This dive site is only two hours from Sydney and can easily be done as a day trip. Highly recommended. Over the years the local dive shop has closed down and reopened a number of times. It has now moved to Toukley. You can also use Pro Dive Central Coast which has been operating under the same ownership for over 20 years. I recommend this operator as being the best to use.